Upon the death of Henry V (1422), Richard Beauchamp became the guardian of the young king, Henry VI. 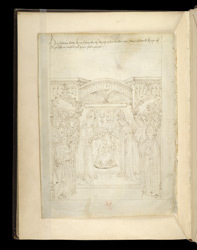 One of the few pictures in which the Earl does not appear, this page shows the coronation of the eight-year-old king at Westminster (1429). Although the Caxton Master often creates innovative compositions, he has depicted the event with the traditional placement of the king in the centre of a symmetrical arrangement of figures and architecture. Such images not only referred to Richard Beauchamp's high-level connections and service to the crown, but they also flattered the ruler, showing positive and idealised human qualities.